Kathy's Search: Do I Remember? 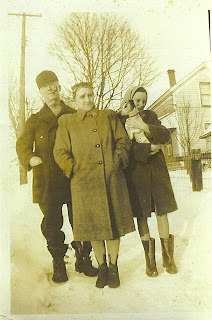 I believe my dad carried this photo of his parents and sister, along with dog, Trixie, to war with him. I love it for the memory of the pipe. Usually I meander along a rolling stream of consciousness process before I connect a family history/herstory discovery with a Sepia Saturday prompt. But this week no such journey was needed. The connection with smoking was direct and immediate. I remember fights with my maternal grandfather over my dislike of his cigarette smoking. Even today I can’t stand the slightest whiff of lingering smoke in a hotel room or on the clothing of a hairdresser. But pipe smoke. That is different. And likely for the powerful sensory memories that bring me back to a place and time for which I have only a dreamlike memory. Thankfully, it answers a self-doubt. Do I remember him or just know the photo? 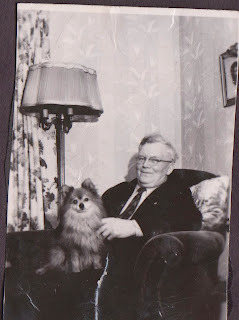 In the furthest reaches of recollection, I am not sure if I really possess any visual memories of my paternal grandfather. I have mind pictures of him sitting in a chair, holding a dog I believe to be named Pooh-Pooh. But is that visual memory real or has it taken shape thanks to the few photos I possess? I can’t be sure. I never hear his voice in my mind’s ear. Was he a storyteller like my father and his brother who could recount a situation, replete with details of the subject’s family tree and the mishaps of their youth, as the tale took its winding course, punctuated with the teller’s index finger shaking the details at his listener? Had this trait been passed from father to sons? I have no idea. But that pipe aroma. Any hint of pipe tobacco jars my sense of place along the time continuum and wafts me back to where the memory of Louis Hart, Jr. resides. His pipe comes alive, its smoke encircling my soul. In the mysterious workings of the brain, it is odor that invokes the most powerful and vivid memories in all of us. For me, that scent is the reassuring substantiation that I did know my paternal grandfather and he knew me. That is comforting. Oh yes, aromas do bring back memories.I agree about pipe tobacco smoke being more tolerable. 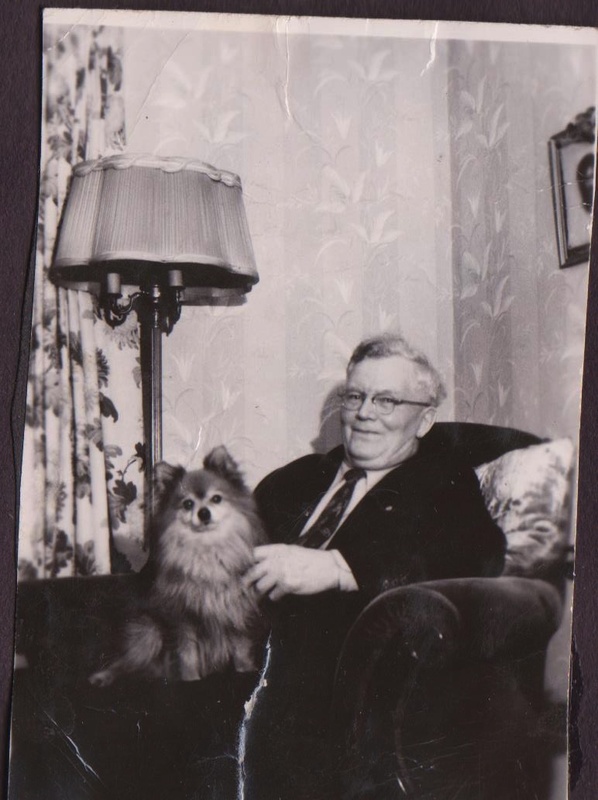 I love the photo of your grandfather and his dog. We once had a dog named Trixie too...guess it was a popular name at one time. This sounds just like me. I have pictures in my head of "memories" but I always wonder if they are REAL memories or pictures I created based on hearing the stories told over and over by my parents, aunts, grandparents, etc. Great photo and post. Scents, aromas, and smells that are good or bad are quite persistent in memory. It is certainly the way other animals bond with their young, or follow a scent trail home. I think sounds and taste are also very similar but inhabit a different part of the brain. Your discussion of memory and photographs is thought provoking. I have wondered the same sorts of things - also am I remembering a person or event, or just remembering the memory of it (if you know what I mean). The use of photographs in stimulating memories, and in the recording of oral family histories, is something that I'd like to explore further on my blog Photo-Sleuth at some stage. I can smell St Bruno pipe tobacco used by one of my uncles to this day. And how rarily we see pipe smokers these days..even less fashionable than cigarettes. Wow, how amazing, I have a few pipe stories to remember as well, from my dad. It's so wonderful that you have the special photo your father carried around with him and survived his war time! My dad went through stages of smoking cigarettes, cigars and the pipe. I always liked the smell of the pipe too. My father smoked a pipe. I like the smell of burning pipe tobacco smoke, but I don't like the smell that lingers on clothes. I have wondered the same about some of my memories. Are they really memories or the memory of a photograph substituting for a real memory. For me, music seems to take me to a time and place more so than a smell. My grandfather smoked a pipe and I can remember all those smells so vividly. Funny I can't remember the last time I saw someone smoking a pipe (well one with tobacco in it!) It seems to be unfashionable now. "Kathy's Search" has been included in the Sites To See for this week. Be assured that I hope this helps to point many new visitors in your direction.